This study aims to increase understanding of how the Irish social security system, including healthcare, operates in respect of non-Irish workers and their families. It provides an overview of the welfare system in Ireland, outlining policies and administrative practices that influence migrant access to social security, particularly focusing on 'discretionary conditions'.1 The access of non-EEA and EEA nationals is compared, where relevant, to that of Irish nationals. The study explores the nexus between migration and social security policymaking, and discusses practical challenges and policy gaps in that regard. The report is based on the Irish contribution to an EU-wide, European Migration Network study on migrant access to social security. 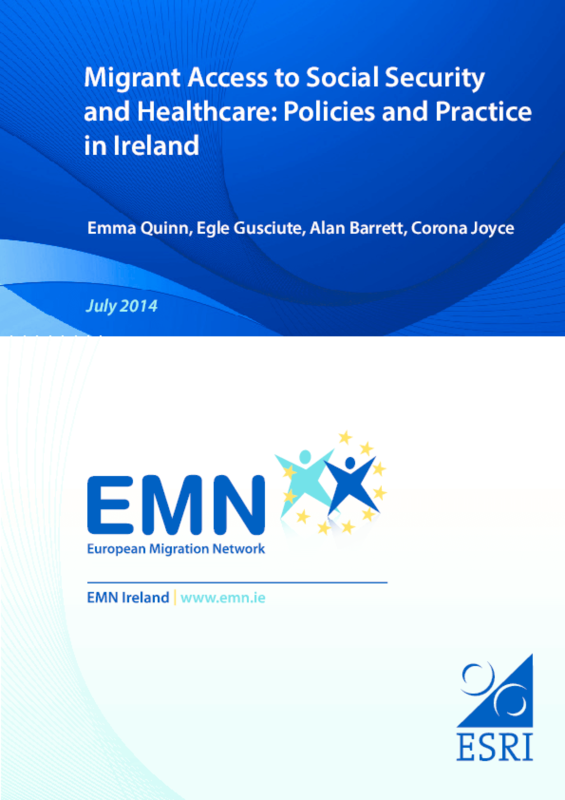 A similar study will be undertaken by each European Migration Network (EMN) National Contact Point (NCP) and a synthesis report will be produced. Copyright 2014 Economic and Social Research Institute (ESRI).